All professional nannies help the kids in their care to learn. The best way to learn is by playing. The preschoolers I care for love The Learning Journey Match It Puzzle Games. These games feature a wide range of award-winning educational titles including: Alphabet Match, Addition, All About Me, Animal Words, Colors and Shapes, Counting , Opposites, Rhyme, First Words, Subtraction, Mathematics, Heads and Tails, Game Sequencing, Upper and Lower Case Letters, and What Goes Together. Each product in the series features a set of self-correcting puzzle pairs that introduce children to a specific educational topic or skill. The brightly illustrated puzzle cards engage children in the learning process in an entertaining way. 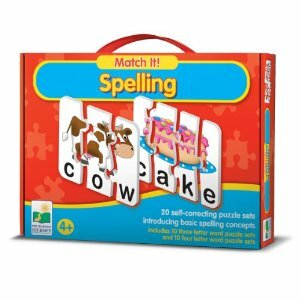 Match It Spelling includes 10 three piece and 10 four piece self-correcting puzzle sets. The recommends these toys for children aged four-years and older. But, I use these with my three-year-old too.